Aroldis Chapman threw live BP from behind a screen on Wednesday. PITTSBURGH — Reds closer Aroldis Chapman has been understanding and patient when it comes to his rehab process. One step at a time. Those steps are getting Chapman closer to returning to the mound. Chapman threw live batting practice for the first time Wednesday afternoon at PNC Park before the Reds and Pirates played the third game of their four-game series. He threw 27 pitches from behind a protective screen for his first action against live batters since he was struck in the forehead with a line drive off the bat of Kansas City’s Salvador Perez during a Cactus League game on March 19. Neftali Soto, Brayan Pena and even third base coach Steve Smith took turns batting against Chapman. Reds manager Bryan Price said Chapman was able to throw all of his pitches — his signature fastball, a slider and changeup — with command and good velocity. Soto, a reserve infielder, was impressed. "He was nasty," said Soto. "Every pitch was really good. It’s like he never stopped pitching. His fastball was jumping, a great slider. It was working well. It was impressive." 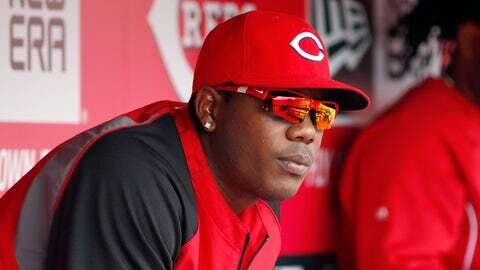 Chapman is scheduled to again throw against live batters this weekend when the Reds travel to Atlanta for the three-game series against the Braves. That session will likely be without a protective screen. If all goes well, he’ll move up to a minor-league rehab assignment with a yet-to-be-announced affiliate. "To be honest with you, I felt very good," said Chapman through Pena, who was acting as his translator. "I’ve been feeling this way probably a couple of weeks, and I’m just trying to continue to improve because I know it’s not going to be easy. It takes time. Now I believe I’m going to go rehab in the minor leagues and it’s a long process. But throwing-wise I feel great; I feel like nothing happened. I’m very pleased with my performance today." Pena, like Chapman, is a native of Cuba. He was behind the plate in Arizona when Chapman was injured in spring training and was as shaken up by the incident as anyone. He has been impressed by Chapman’s recovery. "He was throwing that slider and changeup and then his fastball was electrifying. Everybody knows how hard it is, but he was attacking the strike zone. He was using both sides of the plate. Especially with a hitter like me, he’s got to be careful," said Pena, throwing in a little joke for his friend. "But he did great. Everyone was very excited and very happy to see him go back out there. His confidence was very good. That was a great sign." Chapman said he’s trying not to think too much about the future and the moment he steps back onto the mound in a major-league game. No one knows what will happen when he does. "I know he’s a tough kid. I don’t know if this speaks to how tough you are," said Price. "I think anyone that would go through an experience like that I’m sure would have some reservations. I think one of the things that for me was encouraging about this experience was seeing Alex Cobb come back for Tampa and pitch so beautifully against our club for a guy that went through a similar experience. "I think he’s going to handle it beautifully, but I think there are steps that he has to take along the way. I don’t want to say that I’m not concerned, but I’m very optimistic that he’ll handle this very well." SCHUMAKER UPDATE: Reserve utility player Skip Schumaker will be heading to the Reds’ player development facility in Goodyear, Ariz., possibly as soon as Thursday to start seeing his first live action since dislocating his left shoulder on March 21. Price said Schumaker will get as many at-bats and playing time in the extended Arizona spring training league before starting a rehab assignment with Triple-A affiliate Louisville. That’s a similar progression the Reds used with catcher Devin Mesoraco who started the season on the disabled list with an oblique strain. Schumaker was doing some long tossing at PNC on Wednesday. "(Schumaker) looks really good," said Price. "He’s chomping at the bit to get playing again."